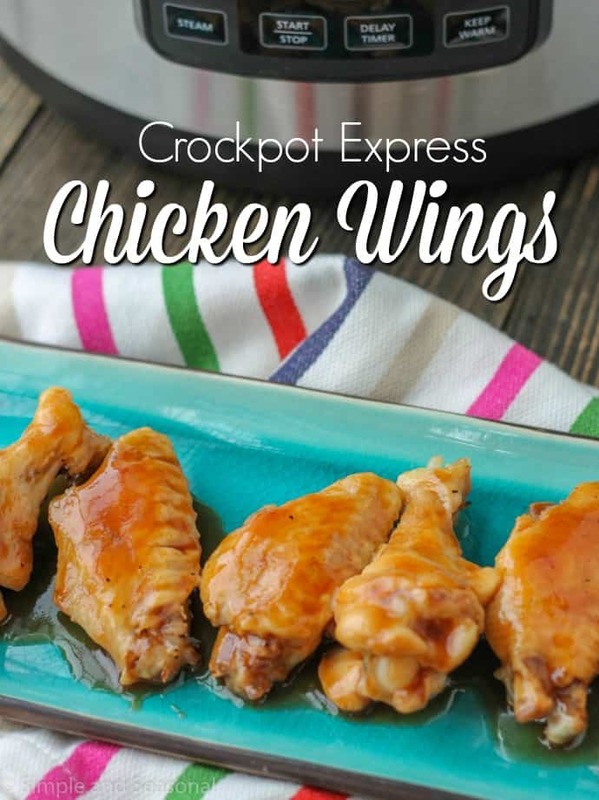 Save time without sacrificing flavor or quality with these Crockpot Express Chicken Wings! Start with frozen wings and then toss in your favorite sauce before serving! Chicken Wings are one of those foods that I always forget about. On occasion, we’ll go to a wings restaurant and I’ll say something like, “These are SO good! Why don’t we have them more often?! 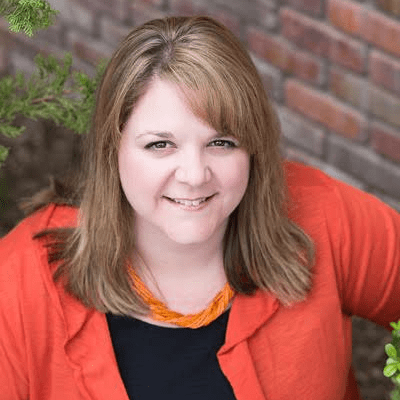 ?” I think for us, the biggest thing is that we don’t like Buffalo sauce. When you go to a restaurant that doesn’t exclusively feature wings, the most common option is Buffalo and my eyes skip right over it. 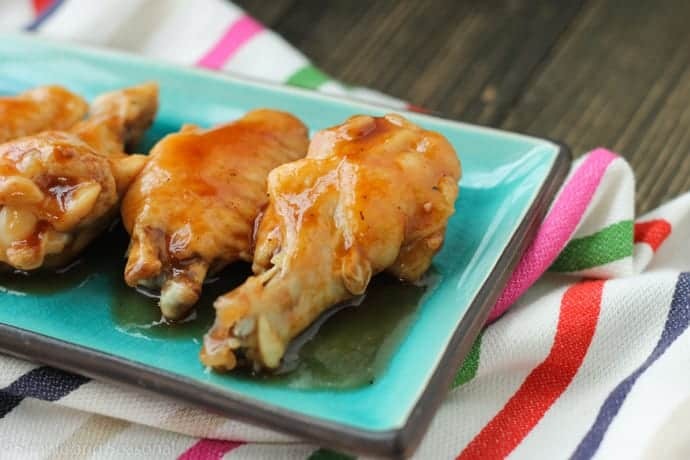 But with football season coming to an end and “the Big Game” right around the corner, more and more people are asking how to make Crockpot Express Chicken Wings. So I tested a few different methods and came up with a great recipe that leaves the wings juicy on the inside and crispy on the outside. Just add your favorite sauce and you’re good to go! The idea of “pre-cooking” wings before putting them in the oven or the fryer isn’t anything new. As a matter of fact, I used some tips and ideas from Alton Brown’s wing recipe to guide me as I tried a pressure cooker version of wings. He suggests steaming them for 10 minutes first and then a long bake time. Making wings in the pressure cooker is essentially the same thing. We start with “steaming” them under pressure and then finish in the oven. I tried cooking wings from frozen as well as thawed, and I also tested finishing them under the broiler versus finishing them on high heat in the oven. I was going for a balance between what’s easy (cooking frozen wings straight from the bag or using the broiler, for example) and what would give best results in the end. You may have already tried wings in your pressure cooker and done them a different way. That’s totally fine. I know many people cook for short times, many use the broiler instead of baking, etc. I just found this recipe to give the best results overall, while still taking far less time and effort than wings normally require. 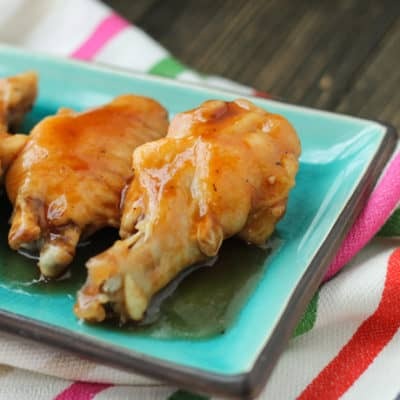 The BEST thing about Crockpot Express Chicken wings (aside from how easy they are to make) is the sauce! The possibilities are endless when it comes to wings, but my favorite has got to be Garlic Parmesan. All that buttery goodness just drips off your fingers and the garlic and Parmesan cheese just make my mouth water. You can also go with BBQ sauce or original Buffalo sauce. The key, though, is to wait to sauce your wings until after cooking. This results in crispier wings and no burnt sauce! Just put your sauce together in a large bowl while the wings are cooking and then when they are done, toss them in the sauce to coat. 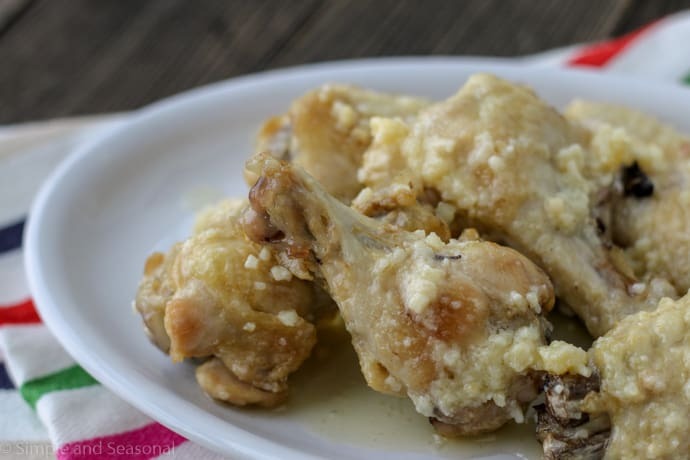 Save time without sacrificing flavor or quality with these Crockpot Express Chicken Wings! Toss in your favorite sauce before serving! Place trivet inside inner pot and add 1 cup of water. Place chicken wings on top of trivet. Stack them as needed or place them in a steamer basket. Press Steam and set for 15 minutes (high pressure.) Press Start/Stop. While pot is coming to pressure, preheat the oven to 450 degrees. When cooking cycle ends, allow natural pressure release (NPR) for 5 minutes and then release any remaining steam. Remove from pressure cooker and pat dry with a paper towel. Place wings on a baking sheet and put in the oven. Bake for 5 minutes, then turn wings and bake for 2 1/2-5 more minutes, or until golden brown and crispy. Remove from oven and toss in your favorite sauce! Stir together melted butter, garlic and Parmesan in a bowl large enough for the wings. Add cooked chicken and toss thoroughly to coat. 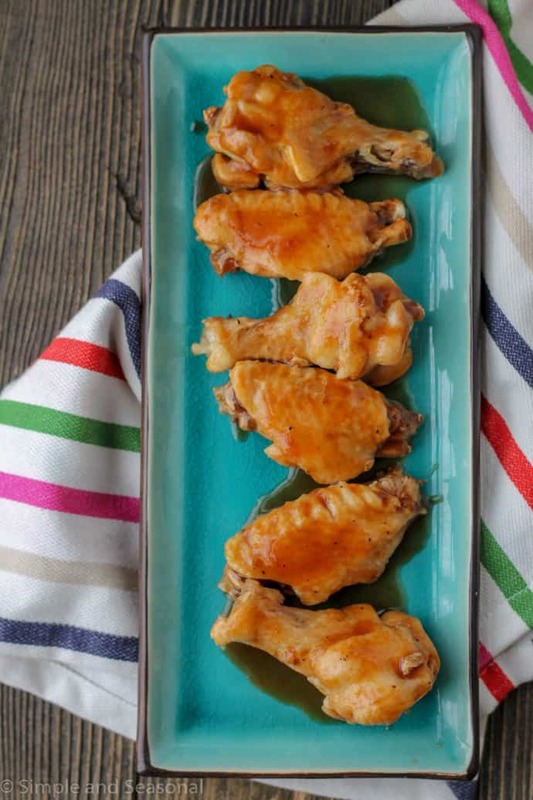 Don’t forget to pin these Crockpot Express Chicken Wings for later! Then check out all my other Crockpot Express Recipes here. Just used sweet baby Rayo BBQ sauce.